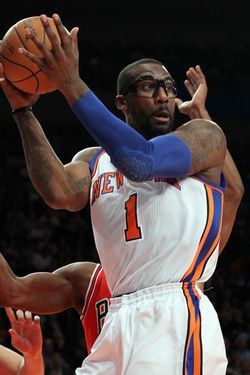 Can Amar’e Stoudemire Revive His Season? It's not exactly the halfway point of this 66-game Knicks season, but it does feel like one. The All-Star break just occurred, and the Knicks are in the midst of a six-day stretch that includes just one game (tonight against the Cavaliers). They're taking this opportunity to stage a sort of halfway training camp to get everybody on the current roster — one that's meaningfully different from the opening night lineup — pointed in the same direction for the remaining 31 games. The training camp-y circumstances have some guys in training camp-y moods, particularly those who've struggled through the first half of the year. No Knick would like to start from scratch more than Amar'e Stoudemire, who's been subpar in pretty much every aspect of his game up to this point. But why did he struggle? And is there legitimate reason to believe he can turn things around? He'll get his body back to where it should be. Amar'e hurt his back during last year's playoffs, and the injury bugged him throughout the summer to the point that he didn't do much game-oriented training, Instead, he hit the weights and (supposedly) added fifteen pounds of muscle to protect his back. Since then, he's looked, well ... quite a bit like someone who didn't play basketball and got significantly heavier during the lockout. His shots have been off, his moves have been a beat behind, and he's just generally looked slower and more earthbound than Amar'e Stoudemire is supposed to look. Now Amar'e's been working to "shed a few pounds" so he can get back to his regular offering of aerial assaults. He'll clear his head. We've no way of knowing exactly how Amar'e has been affected by the death of his older brother just three weeks ago, but it's perfectly understandable that the weight of something so tragic might hinder his performance for quite some time. Perhaps Amar'e was losing sleep or short on appetite, and perhaps that sapped his energy and motivation to exert himself on the court. Isn't that typical of grief? Thankfully, a silver lining of Stoudemire being left off the All-Star team was that he got a chance to take his family on vacation to the Bahamas and hopefully do some healing. He'll have even more time to practice with his teammates. Much has been made (well, by me) of the fact that Carmelo Anthony had yet to practice with Jeremy Lin until this week. Amar'e' returned sooner than Melo did, but he's also pretty short on reps with his point guard. This week's practice-intensive stretch of days off can't hurt. He was starting to play well before he left the team. This is another thing I keep going back to: In the five games before his brother's death and the subsequent weeklong absence from the team, Amar'e averaged 21 points on 52 percent shooting — basically, Amar'e numbers. After struggling all January long, he finally seemed to be turning a corner and looked more like his springy self. Then, the unthinkable suddenly happened and he went a week with basketball being the furthest thing from his mind. That's bound to throw a guy off. Stoudemire acknowledged pretty much all of this in that Beck interview, and suggested that we "stay tuned" for a turnaround in the season's second half. Now, Amar'e's known for his tireless optimism, and plenty of folks around the Internet will tell you he's finished and any suggestion otherwise is naive and grasping at excuses. That could be the case. By the end of the season, we could look silly for ever having bought into the hype. But if you're more of the hopeful type, I think you've got some legitimate stuff to latch onto for now.